A typical student spends three years at university; planning a recording can span a large chunk of that time, and this project was no different. The initial challenge was choosing a theme that complimented the group’s first two albums on the King’s label. We had already explored our more casual side with After hours, and visited very familiar territory to us as King’s Choral Scholars in Twelve days of Christmas. We decided a venture was due into an area in which we, as undergraduates, don’t have quite as much expertise: love. 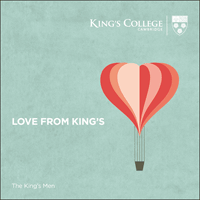 In Love from King’s we present songs exploring love in its many guises. The scope ranges from the heart-rending account of a cheated lover in O Waly Waly, through the hot and cold affections described in Quizás, to the fury found in Adele’s Rolling in the deep. Half of the songs have been arranged specially for this album, including a brand-new composition by Toby Young, a previous member of the group and now a signed Faber composer. As with our previous two releases, we recorded the majority of the tracks in St George’s Church, Chesterton, just down the road from our own Chapel, and a venue which lends itself well to close harmony singing. The church has the perfect balance of natural ambient acoustic and clarity to facilitate production of the distinctive elements found in close harmony. As with After hours, three of the tracks were recorded in the studio at King’s: a fun, new, and altogether very different experience for each of us. Being a choral scholar is, after all, about new experiences! As part of the preparation for this recording, we were very lucky to have the opportunity of having a masterclass with The King’s Singers, whose origins began in a previous incarnation of the King’s Men some 50 years ago now. (It was good to see Pat Dunachie returning too: top alto in Twelve days of Christmas and now David Hurley’s successor in The King’s Singers.) We have tried to bring to our performances on this album many of the ideas that came out of this session with the world's greatest close harmony group, particularly by focussing on highlighting the colours in the accompaniment to replicate instrumental effects, and creating a rich tapestry against which the solo lines sit. This album is the culmination of many months of work: choosing the theme, deciding the tracklist, organising new arrangements, rehearsing, recording, and reviewing. It’s really exciting to be able, finally, to share with you the fruits of our labours. We hope you enjoy it! It’s tempting to describe being a Choral Scholar at King’s as a lifestyle, as opposed to a commitment. This is not to say that these three undergraduate years float by as serenely as a swan on the Cam, but rather that life in the chapel becomes so entwined with the demands of being an undergraduate—talking, thinking, writing, socialising (not necessarily in that order)—that it is hard to tell where one ends and the other begins. It is difficult for me to imagine being at the University without the daily services, the broadcasts, the tours, the recordings and, of course, those wonderful early morning Sunday rehearsals. These ‘everyday’ activities appear alongside, and lay the groundwork for, some less traditional performances for which the Choral Scholars specifically are, perhaps, better known. Among the most memorable is the Singing on the River concert, during which we perform on punts across the Cam to a 2,000-strong audience, gathered on the College’s back lawn. While we sing, we also try our best to stay dry—keeping one eye on the river and the other on the sky. This concert rounds off the numerous ‘May Week’ balls—a time when all the students miraculously transform into nocturnal creatures to celebrate the end of the academic year. Singing at several of the balls is one of our annual commitments, with performances often starting at a time far less godly than we’re used to in Chapel. Fortunately, it’s also a week during which there are no Chapel services—a welcome relief for those of us who value a lie-in after a 5am sunrise performance at the famous Trinity May Ball! Another big annual commitment for the Choral Scholars is our UK King’s Men tour. Traveling to different venues around the country in two teams of seven feels like a classic student road-trip, and bringing our music and bow ties makes it no less fun. The warm welcomes we receive in the towns we visit give new meaning to the word ‘hospitality’ and are genuinely the best part of our King’s Men tours. It would be impossible to describe being a Choral Scholar at King’s without mentioning Christmas. Taking part in the annual broadcasts of Carols from King’s and A Festival of Nine Lessons and Carols is an unforgettable experience. There’s a real buzz when the BBC is in town, save for the moment when the red light flashes in those few seconds before we go live with Once in royal David’s city, and a hushed silence descends on the 1,200 people in the Chapel. Before we don our cassocks though, we’re out in our Father Christmas hats, offering a few tunes to the eager queue outside the Chapel. Some of these people have queued in tents for days and flown around the world to get here, and it’s a real privilege to be able to share in what will be such a memorable Christmas for them. Once Christmas is over and we’re back after some holiday in January, we have the opportunity to make recordings both with the Choir and as the King’s Men. In recent years we've worked on recordings with some amazing orchestras, including the OAE, AAM and the Britten Sinfonia, and we've had the privilege to sing alongside soloists such as Roderick Williams, Ailish Tynan and James Gilchrist. Working with musicians of such calibre is a real highlight of the choral scholar experience. Three or four times a year we also venture beyond Cambridge itself; in recent years, we’ve been to the US, China, Australia, and to a host of European countries. The appreciation for the Choir and its music-making we encounter in these far-flung places is truly incredible, especially when you consider its origins. Could Henry VI have predicted that his little band of choristers would one day be heard around the world? For any Choral Scholar in the 21st century, the core remains unchanged: a tight-knit group of singers, dedicated to filling the vaulted expanse of King’s College Chapel, and the ears of those who visit it – either in person or virtually – with music.